Top aluminium specialist CDW Systems has added the innovative Smarts VS 600 vertical sliding window to its product range to provide customers with even more choice. The VS 600 vertical sliding window incorporates the traditional styling of sash windows with the thermal performance and durability of aluminium. The traditional sash window may be used in heritage and conservation areas where Georgian and Victorian architecture is prominent. New research suggests there are more than 9,800 conservation areas across England’s 336 Local Planning Authorities alone and it is an area of the market that businesses looking to expand and increase their revenue streams can tap into thanks to CDW Systems. With the VS 600, the aluminium fabricator has created a route into more traditional products and conservation areas, as homeowners face the challenge of fulfilling their desire to improve the performance of their home, whilst still preserving the important heritage aesthetics of the property. 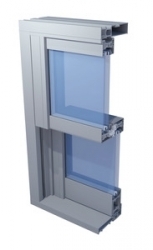 The energy efficient VS 600 window offers a flush opening with no projection into or out of the building. The ease of operation and excellent natural ventilation rates means that VS 600 is also suited to high occupancy buildings. With the trend of aluminium continuing to grow in popularity amongst homeowners, Chris Lock, Sales Office Manager at CDW Systems, is pleased to be able to offer even more choice to installers. Chris comments: “Homeowners are increasingly opting for aluminium windows and doors and what we now have at CDW Systems is a first-class suite of products that our customer base can use for most applications. CDW is one of the UK’s longest running aluminium specialists and has a suite of aluminium products including the Reynaers aluminium sliding folding doors and lift and slide patio doors, which are proving particularly popular; with the company seeing a 37% increase in sales for products from the Reynaers range.